A.R. 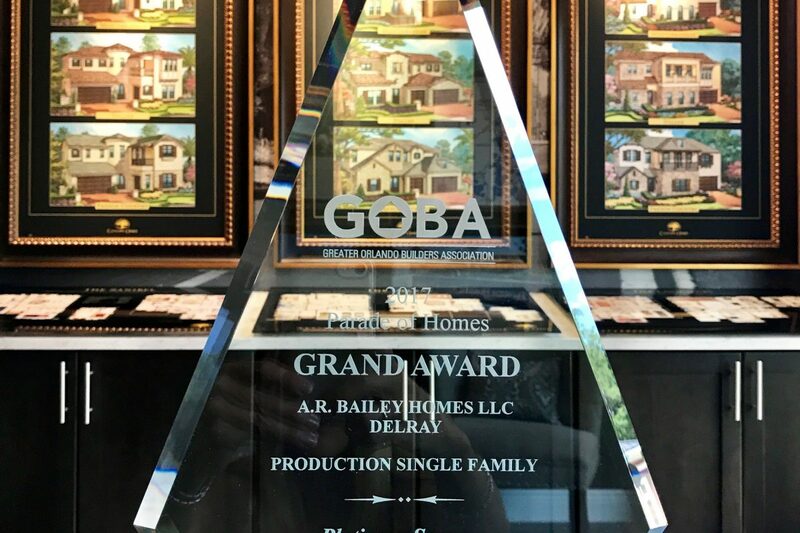 Bailey Homes, builder of Canopy Oaks in Winter Garden, took the Overall Grand Award during the April 25th, 2017, Greater Orlando Builders Association (GOBA) Parade of Homes annual awards ceremony. They won the association’s highest award for its models at Canopy Oaks, a new luxury home community in Winter Garden. 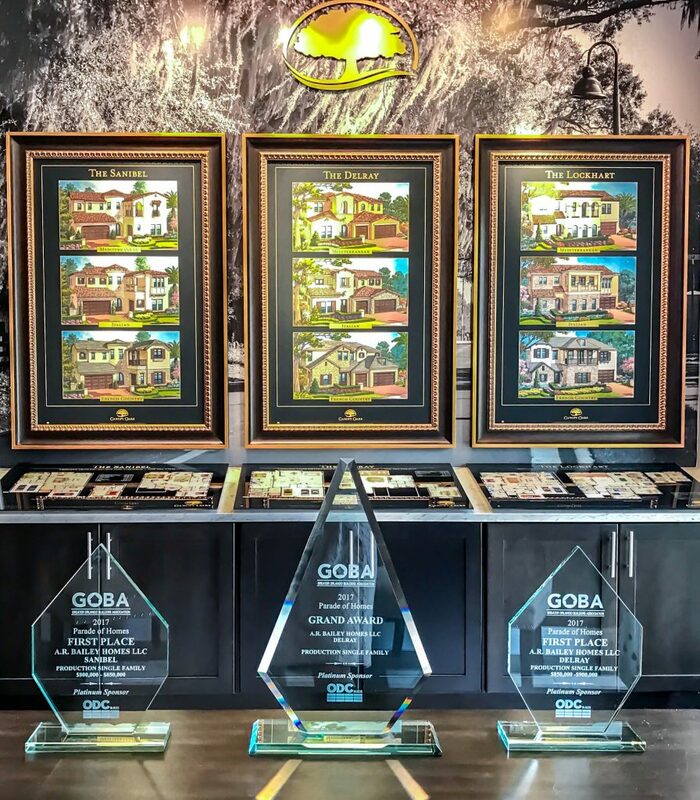 The Delray model at Canopy Oaks was given first place for a production home in the price range of $850,000 to $900,000, and then went on to win the Overall Grand Award. The Delray is a five-bedroom home with eye-catching architectural appeal, a theater room, walk-in wine cellar and kitchen with double island work stations. The competition for the Overall Grand Award included all entries from forty-four of Orlando’s top homebuilders. In addition to receiving this highest award, A.R. Bailey Homes took first place for the Sanibel model at Canopy Oaks in the category of $800,000 to $850,000 production homes. The Sanibel is a four bedroom home that drew the attention of the Southeastern Builder’s Conference earlier this year when it became the winner of the Excel Award for the Best Model in Florida in the $500,000 to $1 million price range. A.R. Bailey Homes, a locally-based company that competes with national production builders in the robust Orlando marketplace, was recently honored by the Orlando Business Journal as one of Central Florida’s fastest-growing companies for 2016 in its “Fast50” listing. Owner Tom Garver of A.R. Bailey Homes, said he was grateful for the recognition and cites the company’s dedication to quality design, affordable elegance and superior customer service as the primary reasons for success. At Canopy Oaks, Garver teamed up once again with developer Mason Simpson to create an intimate gated community of 58 estate homes. Prior to the development of Canopy Oaks, the Winter Garden area had not seen the development of homes over the $600,000 price point in spite of its fantastic location. At Canopy Oaks, Simpson and Garver have found a marketing niche by including standard features found in much pricier custom homes such as kitchens with hidden walk-in pantries and double island work stations, old world style wine cellars, bathrooms that include both a free standing tub and a rainforest walk-through shower, and maintenance-free backyards with multi-level decks and a pool and spa surrounded by peaceful waterfalls. Garver, a hands-on builder, is quick to point out that the Canopy Oaks homes sport eight foot high arched double entry doors made of solid walnut, soaring coffered ceilings finished with stained oak beams, and custom hand forged iron stair rails. “These are details buyers can’t find in typical production homes,” he noted. “The patio sliding doors hide away in telescoping fashion for a seamless indoor outdoor party space. Covered patios have luxurious summer kitchens and even the closets have high-end features such as hardwood shelving. The closer you look, the more you appreciate the attention to detail that goes into every home,“ said Garver. and have secured ten new home contracts. At this pace, Canopy Oaks will be sold out soon! “Buyers seeking exceptional value in the $600,000 to $1.2 million dollar range are spearheading our success,” concluded Simpson.